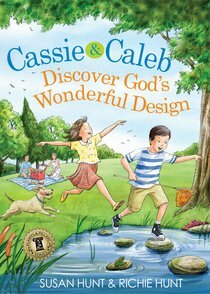 Boys and girls, from 5 to 8 years of age, will love the fun world of Cassie and Caleb, two energetic and inquisitive children discovering the beauty of God's wonderful design. The creational principle that "God created man in his own image ... male and female he created them" (Genesis 1:27) is extraordinary! About "Cassie & Caleb Discover God's Wonderful Design"
Hunt is an active mother and grandmother, a pastor's wife, and the Women in the Church Consultant for the Presbyterian Church in America. She has a degree in Christian education from Columbia Theological Seminary.